A few weeks back I met with a reporter from my local paper. I wanted to speak about my Mysteries for Mutts fundraiser I’m currently doing for the NJSPCA. She arrived with a long list of prepared questions, the majority of them about my book and myself. It was a friendly meeting, very conversational and relaxed. I have no trouble talking about Last Exit; that’s my work and I’ve put much work into it. I was amused by her interest in me… really, I’m not that interesting. I’ve come to realize people are fascinated by my background though I can’t see the big deal. I’m just me. Yes, I’ve spent much of my time around boats, I’ve always said that, and I realize that’s somehow made me a bit… shall we say, different. But that may have been the case, boats or not. I figured most of our conversation was just her getting an idea of who I am. So we talked – about the book, about me, about, at last, the NJSPCA. We wrapped everything up and she told me the article would appear at some point in the coming week or two. Fast forward to this morning. Then sun isn’t up yet; the horizon’s still dark, but there’s the paper in the driveway, tucked just beneath the truck. I bring it in, make a cup of tea and sit down at the kitchen table to read the usual run-down of community news. An apartment fire, still under investigation. Lights are going up in a town recreational field. The winners of the annual ‘Holiday Lights’ competition have been announced. Newly elected officials are being sworn in all over the valley. And… YIKES!!! There’s a cropped picture of ME grinning back from the header of the Community Living section. Arts & Leisure: Local author publishes book Page 34. Flip past the Shoprite sales flyer and… whoa. There’s me again, along with a nice big picture of my book’s cover. I’ve got a full page and then some… it continues for another column on page 36. Uhm… okay. But I thought it was going to be about Mysteries for Mutts, not me. I read through, seeing my words in print. Did I actually say THAT? This is weird. Yes, those are my remarks. So many of them. It’s odd to read them in print, pulled from the context of the conversation and slipped into the paper I’ve read for years. Weird. I honestly figured I’d get a quarter of a page, tucked between the advertisements for local banks and pizza coupons. There’s plenty about me and about the book, and me again, and the book. The fundraiser is mentioned, though the majority of the article is focused on the author and the book. As the caffeine settled into my brain a bit more I realized something about this article was bothering me. It isn’t a bad article at all – in fact it’s quite nice; the only area where I saw any issue was a minor point: my reference to Evanovich was regarding her accuracy on certain details, not her female leads, which I know are not hardened and tough characters. That’ll probably get some of her fans riled up, but it’s likely my original statement would have as well. The reporter went into great detail about me, my writing, the story, and the fund-raiser as well as NJSPCA received mention. It took me a bit more caffeine before I could put my finger on what seemed wrong, and it wasn’t the article itself. I was me. For one, I prefer to avoid notice. I’m a text-book introvert; I can deal well enough with one-on-one interactions but in the grand scheme of things I really prefer to stay off the radar. 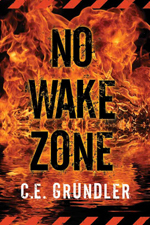 I don’t mind when the focus is on my book, the fund-raiser, my boat, you name it. Just pay no mind to the person behind the curtain. There are enough other people in the world who want the spotlight; I’m not one of them. And I suspect a portion of my discomfort is seeing my spoken words in print. People tell me I’m well-spoken, though I’ve never thought so and this only cements that belief. Writing is my preferred medium; I can select my words then return to edit and refine them further. I chose each and every word with great though, weaving them together in precisely the manner I deem fitting, even at this hour of the morning. I could care less how I’m dressed or what my hair looks like, (and there’s a photo of me as proof!) but my words? I’m very self-conscious of my words, even more so than I realized. Oh well. Off to start my day, no longer quite as anonymous as usual. On an aside, there’s been another very nice review posted today at Tiffany’s Bookshelf. 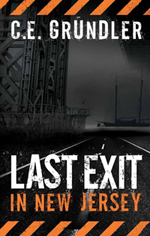 And in Red Adept’s Annual Indie Awards, she named Last Exit In New Jersey as one of the top three mysteries of 2010!